People have always been fascinated by the bloodlines of royal families. Perhaps none is more fascinating than the House of Romanov that ruled Russia until Czar Nicholas II abdicated in 1917. The fate of Czar Nicholas II, his wife Alexandra, their four daughters and their son the 13-year-old Crown Prince Alexei has always inspired tales of mystery and intrigue. 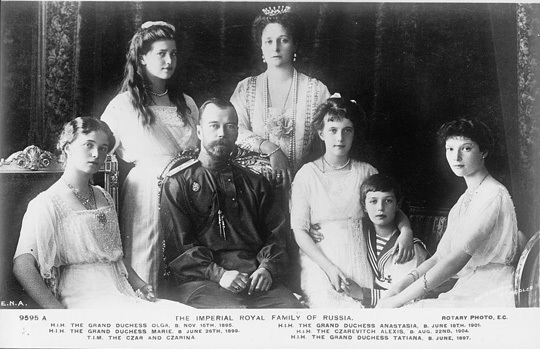 DNA identification has now put to rest the final fate of the Russian royal family. The First World War seriously weakened Russia as the combined might of the German and Austro-Hungarian armies overwhelmed Russian defenses. By the spring of 1917, Russia was on the verge of collapse. Rebellions broke out all over Russia as acute food shortages and extreme cold weather incited the population to riot. Czar Nicholas II was forced to abdicate in March 1917. The power vacuum was quickly filled by parties of all political stripes. The Bolshevik revolution resulted in Lenin and the Communists gaining power in October 1917. This eventually ended up sealing the Romanov’s fate. Initially, Lenin planned a show trial for Nicholas II to blame the former Czar for all the ills that were affecting Russia. Lenin moved the Romanov family and their immediate servants in April 1918 to a country house in Yekaterinburg to keep them out of the hands of Imperial forces. Yekaterinburg was 900 miles east of Russia on the eastern side of the Ural Mountains in central Russia. However, as the country became mired in civil war, Lenin came to the conclusion the Romanov family was a potent symbol of the old regime and a potential rallying cry for his enemies. According to the diary of Leon Trotsky, Lenin himself personally ordered their execution. In July 1918, the Romanov family along with their immediate servants was executed by gun and bayonet in the basement of the house where they were held captive. Over the years, numerous stories circulated that Anastasia, one of Nicholas II’s four daughters had managed to escape the execution. A search of the area where the family was being held finally resulted in five bodies being found in 1991 under a dirt road in Yekaterinburg. Independent DNA studies concluded that the remains were those of Nicholas II, his wife Alexandra and three of his four daughters. The fate of his fourth daughter and his son, the Crown Prince Alexei, was still unknown. A second set of bone fragments was eventually found in the summer of 2007 not far from the location of the original bodies. These, however, were different from the bodies discovered in 1991. It was obvious that these bone fragments had been damaged by more than just time and natural decay. Forensic research subsequently confirmed the bone fragments had been subjected to both acid and fire. It appeared as though the executioners had attempted to fully destroy these bodies. Advanced genomic analysis of the bone fragments was completed in February 2009. The work was conducted by the University of Massachusetts Medical School in cooperation with the Russian Academy of Science and the Russian Academy of Medical Sciences. The findings were published in the Proceedings of the National Academy of Sciences. The results of the advanced DNA analysis confirmed the bone fragments are the remains of the two missing children of Nicholas II: the 13-year-old Crown Prince Alexei and his older sister Anastasia. After 90 years, the fate of the Russian royal family has finally been solved. •	The title Czar (often written as Tsar) literally means Caesar. •	The House of Romanov ruled Russia from 1613 to 1917. The more accurate genealogical name for the dynasty is Holstein-Gottorp-Romanov. •	The Romanovs were originally one of two dozen Russian noble families before rising to become tsars. The family originated in Germany. All of the Romanov leaders took German consorts as their wife, including Czar Nicholas II, whose wife Alexandra was German. This cost Czar Nicholas II considerably during World War I when Russia was at war with Germany. •	Czar Nicholas II’s wife Alexandra (nee Fyodorovna) was a granddaughter of Queen Victoria of England. She inherited the gene that causes hemophilia (common today in the English royal family and several other royal families around Europe), which she passed on to her son Crown Prince Alexei. •	Crown Prince Alexei as the Czar-designate (known as the Tsarevich) grew up as a fragile young boy because of his hemophilia condition. His mother Alexandra eventually gave up on doctors and turned to mystics and holy men to try to cure his condition. This is how the mystic Rasputin entered the lives of the Russian royal family. Rasputin was thought to have great influence over the affairs of Czar Nicholas II in the later days of his reign.